Earth. 6th ed. Boston: McGraw-Hill, 2002. Windley, Brian F. The Evolving Continents. 3rd ed. 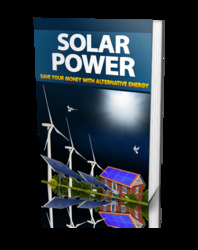 Chichester, England: John Wiley & Sons, 1995.
photosynthesis Green plants, algae, and some bacteria trap solar energy and use it to drive a series of chemical reactions that results in the production of sugars, such as glucose, in a process called photosynthesis. The resulting sugars form the basic food for the plant as well as for insects and animals that eat these plants. Photosynthesis is therefore one of the most important processes for life on Earth. In order for photosynthesis to occur, the photosynthetic organisms must contain pigments such as chlorophyll. In plant cells, structures called chloroplasts contain the chlorophyll and the other necessary components. The most common type of photosynthesis also requires carbon dioxide and water and produces oxygen, also necessary for most life to exist on the planet. Before simple single-celled organisms developed the ability to carry out photosynthesis in the Precambrian, the atmosphere probably contained very little oxygen. Therefore, the process has also been largely responsible for changing the conditions on the planet's surface to make it more hospitable for the development of new, more complex life-forms and for conditions to evolve so that they are suitable for humans. See also biosphere; environmental geology. planetary nebula A planetary nebula is the name for a type of emission nebula consisting of a glowing shell of gas and plasma surrounding a central core of a star that went through its hydrogen-and helium-burning stages, ejecting the outer layers of the dying giant star in one of the last stages of its evolution. The core consists of dense carbon ash, formed as a product of nuclear fusion of hydrogen and then helium, which accumulated in the core, then blew away the outer hydrogen- and helium-rich parts of the outer layers of the star as it died. Planetary nebulae have nothing to do with planets, but were named as such in the 1700s by astronomers who could observe faint blurry areas that were not as sharp as stars, and that resembled planets at the time when only crude telescopes were available. Planetary nebulae last only a few tens of thousands of years, compared to billions of years for the earlier life times of the star. 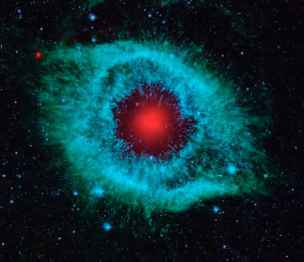 Famous examples of planetary nebulae include the Cat's Eye Nebula and the Dumbbell Nebula. plate tectonics The theory of plate tectonics guides the study of the large-scale evolution of the lithosphere of the Earth. In the 1960s, the Earth sciences experienced a scientific revolution, when the paradigm of plate tectonics was formulated from a number of previous hypotheses that attempted to explain different aspects about the evolution of continents, oceans, and mountain belts. New plate material is created at mid-ocean ridges and destroyed when it sinks back into the mantle in deep-sea trenches. Scientists had known for some time that the Earth is divided into many layers defined mostly by chemical characteristics, including the inner core, outer core, mantle, and crust. The plate-tectonic paradigm led to the understanding that the Earth is also divided mechanically and includes a rigid outer layer, called the lithosphere, sitting upon a very weak layer containing a small amount of partial melt of peridotite, termed the asthenosphere. 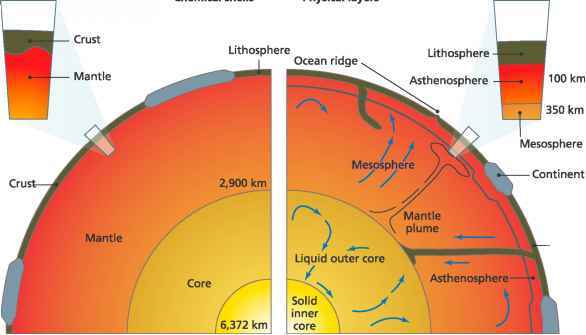 The lithosphere is about 78 miles (125 km) thick under continents and 47 miles (75 km) thick under oceans, whereas the asthe-nosphere extends to about 155 miles (250 km) depth. The basic tenet of plate tectonics is that the outer shell or lithosphere of the Earth is broken into about twelve large rigid blocks or plates that are all moving relative to one another. These plates are torsionally rigid, meaning that they can rotate about on the surface and not deform significantly internally. Most deformation of plates occurs along their edges, where they interact with other plates. Plate tectonics has unified the Earth sciences, bringing together diverse fields such as structural geology, geophysics, sedimentology and stratigraphy, paleontology, geochronology, and geomorphol-ogy, especially with respect to active tectonics (also known as neotectonics). 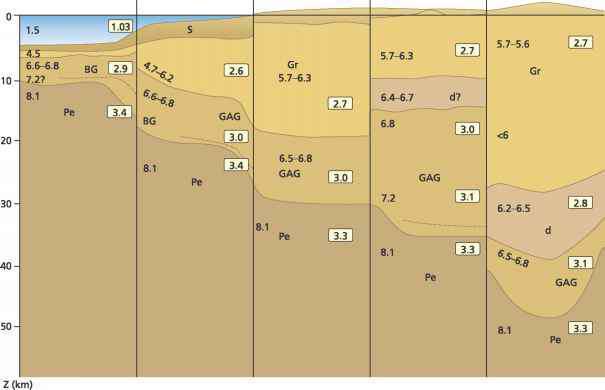 Plate motion almost always involves the melting of rocks, so other fields are also important, including igneous petrology, metamor-phic petrology, and geochemistry (including isotope geochemistry). G Infobase Publishing olivine.) The average upper mantle composition is equivalent to peridotite. (The density of peridotite is 3.3 g/cm3; its mineralogy includes olivine, clinopy-roxene, and orthopyroxene.) Considering the densities of these rock types, the crust can be thought of as floating on the mantle; rheologically, the lithosphere floats on the asthenosphere. The plate tectonic paradigm states that the Earth's outer shell, or lithosphere, is broken into 12 large and about 20 smaller blocks, called plates, that are all moving with respect to each other. The plates are rigid, and they deform along their edges but not internally when they move. 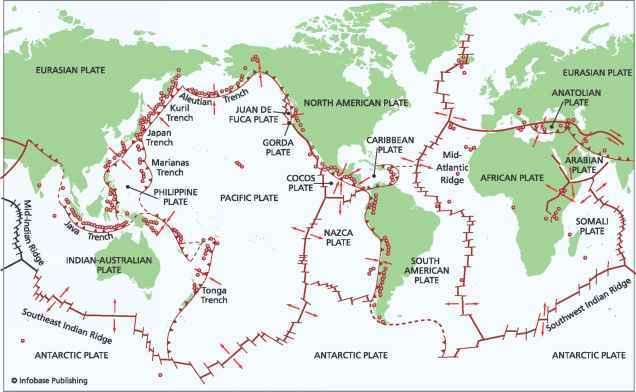 The edges of plates therefore serve as home for most of the Earth's mountain ranges and active volcanoes and are where most of the world's earthquakes occur. The plates move in response to heating of the mantle by radioactive decay and somewhat resemble lumps floating in a pot of boiling stew. The movement of plates on the spherical Earth can be described as a rotation about a pole of rotation, using a theorem first described by Euler in 1776. Euler's theorem states that any movement of a spherical plate over a spherical surface can be described as a rotation about an axis that passes through the cen ter of the sphere. The place where the axis of rotation passes through the surface of the Earth is referred to as the pole of rotation. The pole of rotation can be thought of as analogous to a pair of scissors opening and closing. The motions of one side of the scissors can be described as a rotation of the other side about the pin in a pair of scissors, either opening or closing the blades of the scissors. The motion of plates about a pole of rotation is described using an angular velocity. As the plates rotate, locations near the pole of rotation experience low angular velocities, whereas points on the same plates that are far from the pole of rotation experience much greater angular velocities. Therefore, oceanic-spreading rates or convergence rates along subduction zones may vary greatly along a single plate boundary. This type of relationship is similar to a marching band going around a corner. The musicians near the corner have to march in place and pivot (acting as a pole of rotation) while the musicians on the outside of the corner need to march quickly to keep the lines in the band formation straight as they go around the corner. Pole of rotation on a sphere. 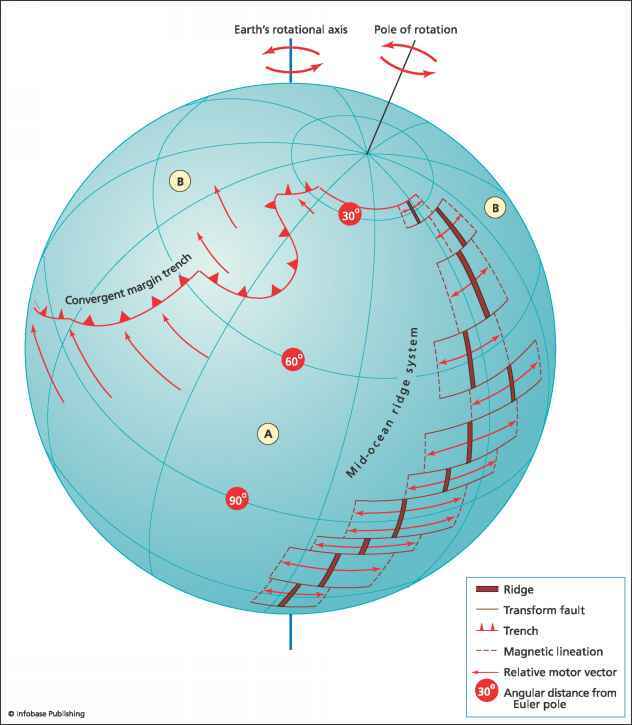 Plate A rotates away from Plate B, with ridge axes falling on great circles intersecting at pole of rotation and oceanic transform faults falling along small circles that are concentric about the pole of rotation. The angular velocity of the plates increases with increasing distance from the pole of rotation. so that the ridge axes all point toward the pole of rotation and are aligned on great circles about the pole of rotation. Transform faults lie on small circles that are concentric about the pole of rotation. In con trast, convergent boundaries can lie at any angle with respect to poles of rotation. where two plates meet forms the basis for defining three fundamental types of plate boundaries. Divergent boundaries are where two plates move apart, creating a void that typically becomes filled by new oceanic crust that wells up to fill the progressively opening hole. Convergent boundaries are where two plates move toward each other, resulting in one plate sliding beneath the other (when a dense oceanic plate is involved), or collision and deformation (when two continental plates are involved). Transform boundaries form where two plates slide past each other, moving in opposite but parallel directions, such as along the San Andreas fault in California. since all plates are moving with respect to each other, the surface of the Earth is made up of a mosaic of various plate boundaries, providing geologists with an amazing diversity of different geological environments to study. Every time one plate moves, the others must move to accommodate this motion, creating a never-ending saga of different plate configurations.